Laguna Carhuacocha. Crédtios: Marcos Terra. 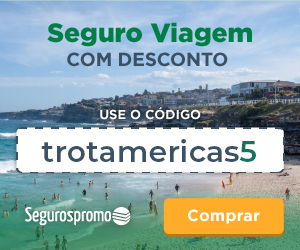 Laguna Churup: atividade de aclimatação gratuita para os participantes da travessia. Créditos: Júlio César Petrini. Entardecer na Laguna Carhuacohca. Créditos: Jack Brauer. Paisagem de Ancash. Créditos: Edson Vandeira. Laguna ancashina. Crédtios: Edson Vandeira. Travessia do Paso Siula. Créditos: Edson Vandeira. 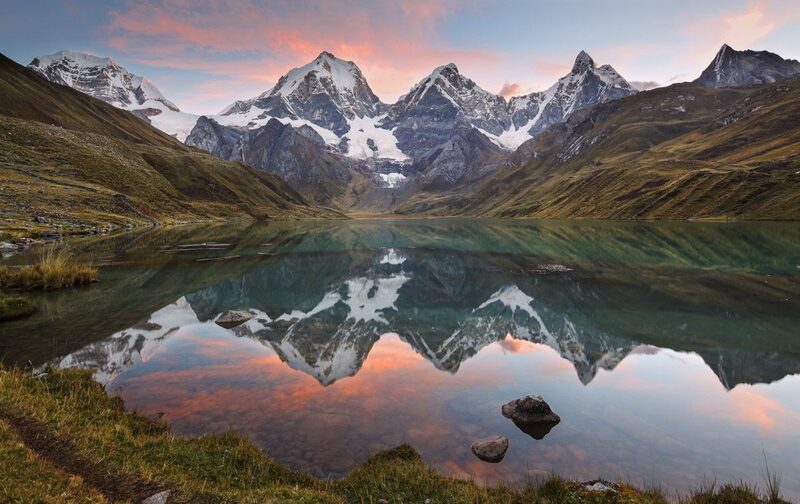 Relevance: one of the most beautiful hikes in the world; great for initiation in high altitude sports; sighting of diverse Andean fauna, beautiful snow-capped mountains and lagoons; and opportunity to taste locally one of the best gastronomies in the World. Arrival to Lima and bus trip to the city of Huaraz. Suggestion: travel by night bus with Cruz del Sur company (more comfort and safety). Our guide-leader Francisco Mayhuay will welcome us at the bus terminal and we will head to the hotel. We will proceed to early check-in and have a few hours of rest. 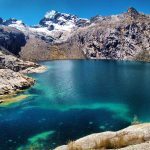 In the afternoon, depending on the mood of each member, we will carry out an acclimatization walk to the Laguna Churup (4,450 masl). 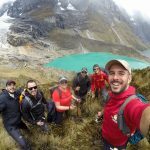 The activity is a courtesy and has the main objectives of integrating the group and mitigating the effects of altitude during the first days of the crossing. It is important not to exagerate with food and alcoholic beverages in this first day, regardless of previous experience in altitude. Following the wellness guidelines, everyone will have a good night of sleep. Overnight at hotel, at 3,052 masl. 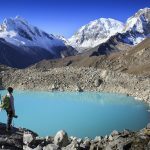 Laguna Churup: free acclimatization activity. Credits: Júlio César Petrini. Transfer to Cuartelwain with stops for visitation in the villages of Chiquian and Llamac. There is no physical activity this day, because we will still be cautious and attentive to the effects of altitude in each participant. The acclimatization window will finish at night. We will arrive early to the camp to dine and organize the equipment that will be transported on donkeys the next day. Overnight in tents, at 4,170 masl. After breakfast, we will start the first day of crossing with our bodies rested. 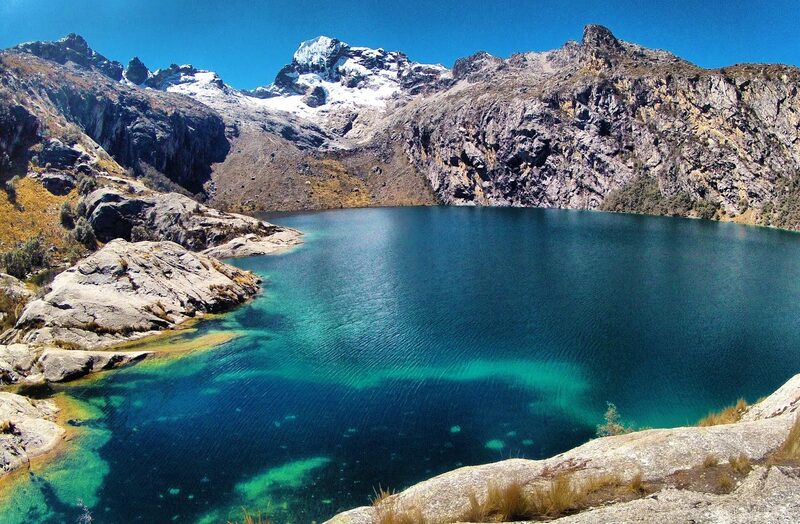 The first challenge is an ascent of 2 ½ hours and 580 meters of elevation to the Qaqanan Pass (4,750 masl). Lunch on the way. 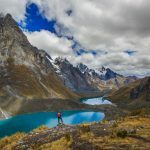 After resting and admiring the Pucacocha and Yanacocha Lagoons from above, we will descend the eastern side of the Huayhuash Mountain Range and walk 2 hours to the camp on the banks of the Mitucocha Lagoon. To reward the effort, we will dine overlooking the Nevados Ninashanca, Jirishanca and Rondoy. Overnight in tents at 4,230 meters. After breakfast, we will start the journey of 2 ½ hours to the Carhuac Pass (4,600 masl). At this point, we will appreciate the view of the Nevados Yerupaja, Siula Grande and El Toro from above. 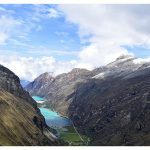 After resting and taking lots of photos, we started descending 2 hours to Laguna Carhuacocha where we will enjoy the late afternoon with a splendid panorama. Lunch on the way, dinner at the camp. Overnight in tents, at 4,138 m.
Twilight at Laguna Carhuacohca. Credits: Jack Brauer. It’s the hardest day of the crossing. We will wake up earlier than on the previous days, and after breakfast, we will continue to Paso Siula (4,834 masl) for approximately 4 hours. 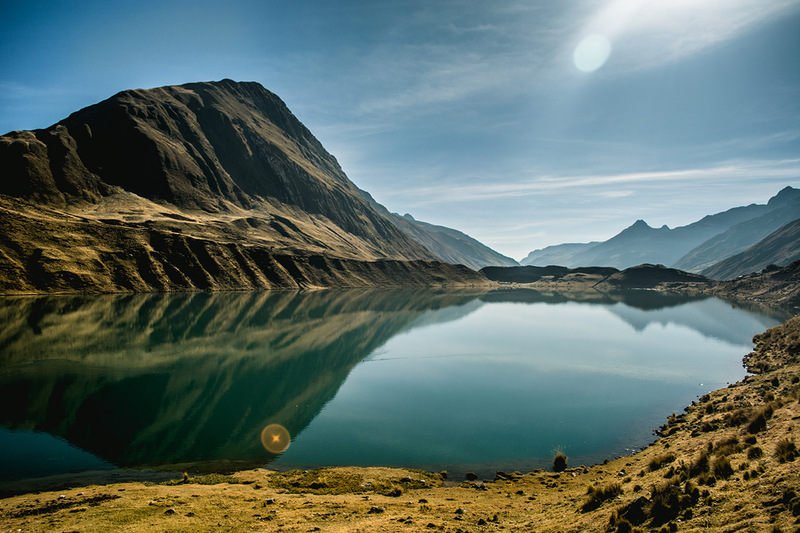 On the way we will see the Lagunas Qanrajancacocha, Siulacocha and Quesillococha that form an otherworldly scenario, each one with a different tonality. The descent this time will last 3 hours and allow you to see the Nevados Carnicero (5,960 masl), Jurao (5,600) and Trapecio (5,644 masl). Lunch on the way, dinner at the camp. Overnight in tents at 4,330 masl. The walk will be long, but will offer an unforgettable reward. 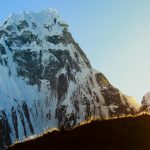 The day begins with the usual breakfast, followed by a 2 hour hike up to Paso Portachuelo (4,750 masl) – border of the Huayhuash and Raura mountain ranges – continuing with a 2 hour descent to Laguna Viconga. The highlight this time will be a thermal bath just 15 minutes from the camp where we will spend the night. Lunch on the way, dinner at the camp. Overnight in tents, at 4,407 masl. We start the day with the traditional coffee in the camp and, after organizing the belongings, we will start the journey. 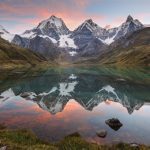 At the end of the ascent of 3 hours to Paso Cuyoc (5,000 masl) we will be presented with a beautiful panoramic view of the Raura and Huayhuash Mountain Ranges. The descent to the camp will last 2 hours. Lunch on the way, dinner at the camp. Overnight in tents, at 4,600 masl. On this day, after breakfast, we will cross Paso San Antonio (5,200 masl), the highest of all crossing. There we can see a magical scenario comprising the Nevados Yerupajá, Siula Grande, Juraro and Carnicero and the Jurao and Siulacocha Lagoons. The climb is from 3 to 4 hours and the descent from 3 hours. 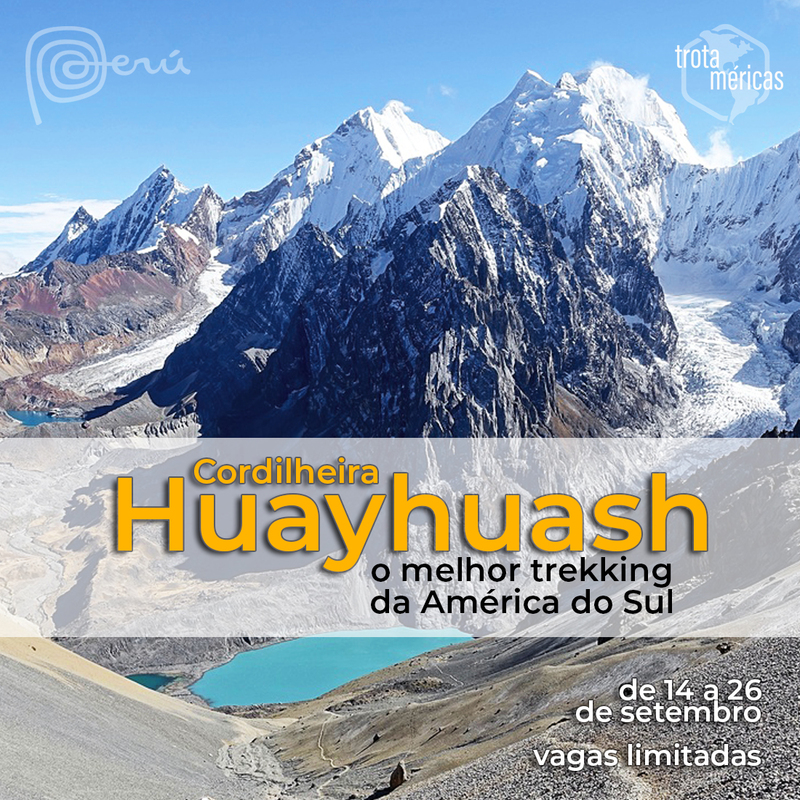 In the afternoon, we will arrive at the village of Huayllapa, the only one to be visited during every walk. For those who miss a beer, it’s time to relax and regain energy to face the last 3 days of crossing. Lunch on the way, dinner at the camp set up near the village. Overnight in tents, at 3,630 masl. 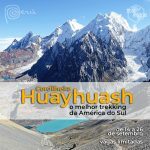 Breakfast in Huayllapa and 5-hour walk to Tapush Pass (4,850 masl), where we will observe the famous Nevado Diablo Mudo (5,350 masl). The descent to the Angushcancha camp lasts 2 hours. 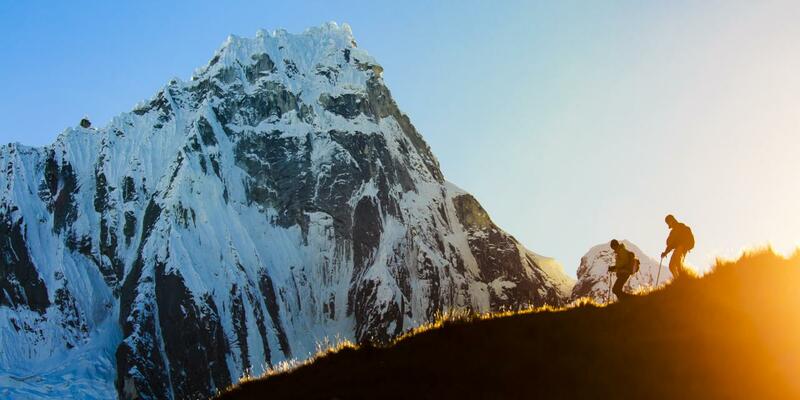 This camp is also used by climbers who go and return from the peak Diablo Mudo. Lunch on the way, dinner at the camp. Overnight in tents, at 4,320 masl. 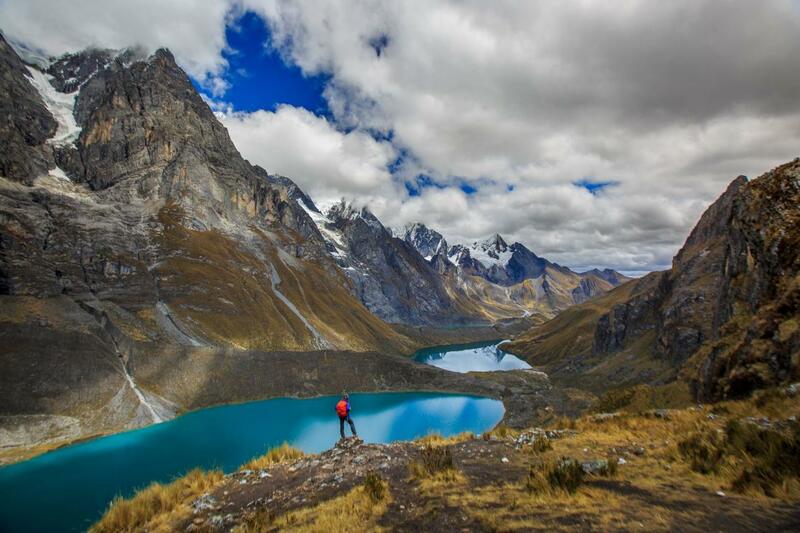 Day to take the penultimate crossing of the pass and see the second highest mountain in Peru: Yerupaja (6,634 masl). After breakfast, it will be 5 hours between ascending and descending Huacrish Quebrada until Laguna Jahuacocha. Lunch on the way, dinner at the camp. Overnight in tents at 4,070 masl. The last day of this fantastic crossing. It will be 2 ½ hours to the last viewpoint: Paso Pampa Lllamac (4,300 masl). From there it will be 2 hours to Llamac, where we will embark to Huaraz. At night, we will get to know the “huaracina” night and make a lively “confraternización final”. Time to take that well-deserved Pisco Sour – a delicious peruvian cocktail – and indulge in some of the wonders of Peruvian gastronomy like Ceviche, Lomo Saltado, Aji de Gallina, Rocoto Relleno, Papa a la Huancaína, among others. On this day, only breakfast is included. Overnight at hotel, at 3,052 masl. 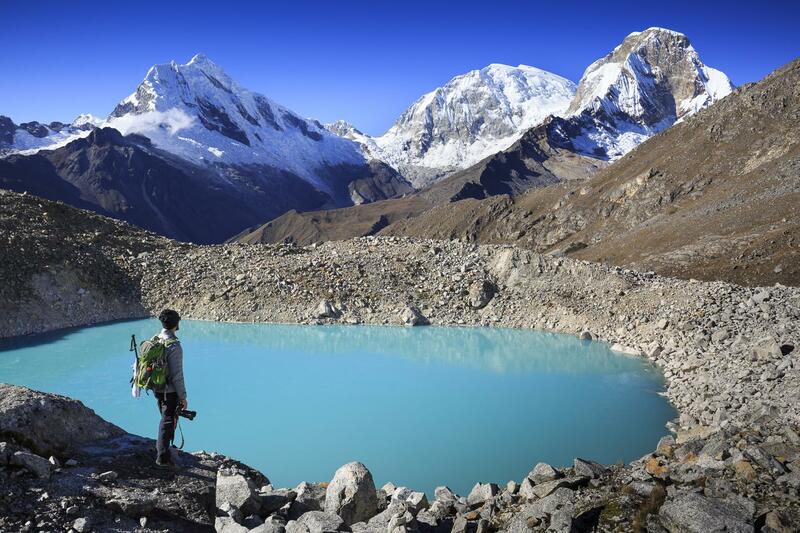 Those wishing to extend their stay in Peru will receive free advice to prepare a personalized itinerary and help to hire other activities in Huaraz. 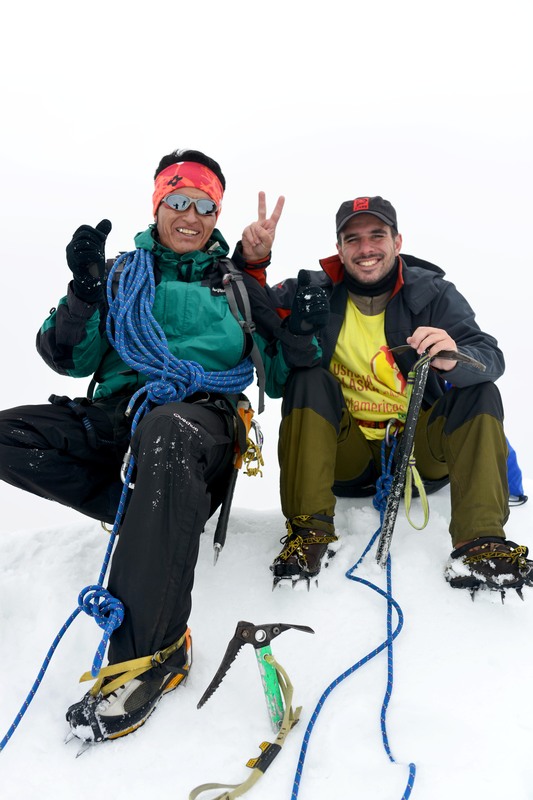 Francisco Mayhuay and Rafa Trotamundos, at the Nevado Mateo summit (5.150 masl), near Huaraz. Credits: Gabriel Lussier. An andinista since childhood and born in a humble family, he began his working life as a arriero (responsible for carrying goods on donkeys on mountain expeditions), but soon showed interest in learning mountain techniques, first aid procedures, customer care and cooking for camp. 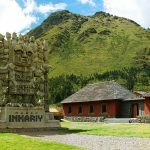 A profound connoisseur of Peruvian and Ancashian culture, he became a tour guide when Huaraz was still a city known only to professional mountaineers. 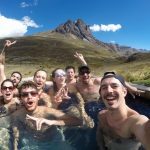 He made many friends around the world and, after 18 years working for local agencies, gained enough experience to start his own company specializing in personalized trekking in the Cordilleras Blanco and Huayhuash: the Franpisco Adventure. 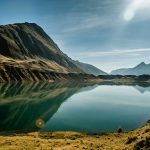 Backpacker and expeditionist with experience of crossings in 38 countries of 4 continents. Creator of project Trotaméricas, recently pedaled 2,500 km in North America and worked as a volcano guide in Nicaragua. 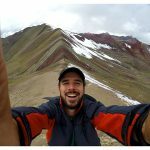 He is a pioneer member of the Couchsurfing network, speaks 5 languages and is currently writing his first travel memoirs book.